Treat yourself to one of the best gardening books of the year. Or any one of them would make a wonderful gift. 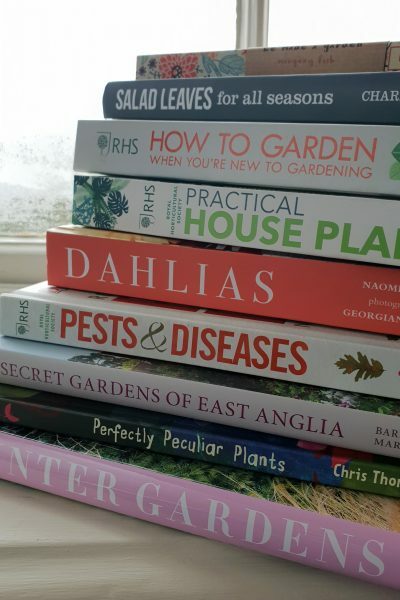 If you’re asking the question ‘why do we need gardening books now that we have the internet?’ then my reply is that – broadly speaking – the internet is for information and books are for inspiration. Does that seem fair? If you turn to the internet, it’s usually to answer a very specific question (unless, of course, you are suscribing to a regular blog like this). You find your answer. You leave. I can recommend these books, either to read yourself or to give as presents. When you keep a book by your bed or sofa, you can pick it up and read it at any time. You obviously bought it (or were given it) for a reason, but you are likely to come across ideas and tips that you might not even have considered asking about. So if you’re thinking of buying a book as a present or as a treat for yourself, here are my recommendations. Links to Amazon are affiliate, which means I may get small fee if you buy, but it doesn’t affect the price you pay. It helps to support this blog, so if you do buy, thank you! Books used to be divided into ‘practical’ and ‘beautiful’ (usually coffee-table type books). Now many of the most stunningly visual books also have a strong practical aspect. For example, Naomi Slade’s Dahlias is a glorious visual celebration of these newly fashionable flowers. But it also teaches you about how to choose and care for dahlias. As a long-time dahlia lover, I both enjoyed this book and learned from it. And Cedric Pollet’s Winter Gardens, which won Book of the Year in the Garden Media Guild awards, lives up to its claim of ‘re-inventing the season.’ Books and articles about winter gardens have traditionally majored on frost-rimmed topiary and statues. This book is all about the plants that glow, shine, shimmer and tremble in the winter sun. It’s about bark, stems and grasses, heathers, evergreens and seedheads, and how they work together. There’s a super-useful listing at the back to help you choose plants for winter interest. Another new direction is the gardening book as a tour of gardens you would not otherwise see. Secret Gardens of East Anglia, by Barbara Segall with photographs by Marcus Harpur is a good example. A friend of mine kept her copy of Secret Gardens of East Anglia on a bedside table in her guest room, so that people could enjoy leafing through its glorious gardens and well-written descriptions. Imagine her consternation when one guest turned up with another copy as a present. She had to race upstairs ahead of the guest, whip the book away from the bedside table and edge out of the room with it hidden behind her back. It’s coffee-table size so not easy to conceal. It is, however, a perfect present for anyone who loves gardens and has any connection with East Anglia. Practical gardening books have upped their game, too. Printed on high quality paper, with good design and photography, today’s practical manuals are like the best cookery books – contemporary in style but rugged enough to withstand life being thrown at their pages. The RHS’s How to Garden When You’re New to Gardening could sit happily on an Instagrammer’s image-conscious book shelf. And the RHS’s new edition Pests & Diseases – plant-by-plant advice manages to make snails, aphids and rust spots look quite glamorous on the cover. Inside, you will be relieved to know, it is tightly packed with information, practical tips and clear photos so that you can identify your gardening problems and deal with them. The Middlesized Garden blog is taking a break for Christmas and will be back in the New Year. Happy Christmas and see you in 2019! A breathtakingly beautiful book with genuinely useful information about planning and planting a garden for winter. There is beautiful photography of major winter gardens in Britain and Europe, and a how-to listing of plants at the back. Possibly the most beautiful book I have seen this year. I've just recommended this as a Christmas present for a 20-something with a balcony, but it would be just as good for anyone who gave up house plants years ago because they kept dying. Stylish and contemporary display ideas plus plant-by-plant identification and care. Comprehensive, informative and well designed, this is one for those acquiring a garden for the first time, or as a reference for anyone whose gardening knowledge is patchy. Lots of clear photographs and close-ups, Aimed at todays' smaller garden, with tips on growing veg in containers, soft fruit for small spaces and choosing trees for small gardens. Charles Dowding has been championing 'no dig' gardening for many years, and his message is now going mainstream. Like all his books, this is practical and readable. 'You do not need a large garden to grow good amounts of leaves', says Charles, as he explains his 'high yields, small spaces, special methods' philosophy. This is not new - Margery Fish wrote it in 1956, but it is an adorable edition. With its vintage-style cover, it would make a charming present. Margery Fish's writing and advice is still relevant and interesting - read her account of making a rock garden out of household and garden debris. Plant names have been updated by Graham Rice. It's an entertaining insight into a creative gardening mind. Naomi Slade explains the history and botany of dahlias, with profiles of 65 types of dahlia, all lavishly illustrated with Georgianna Lane's gorgeous photographs. Advice on each dahlia variety includes how good it would be for cutting, showing, in the garden or growing in containers. A must for dahlia lovers. There's a broad range of garden styles in this enjoyable book - from the wonderfully vibrant saturated colours of Ulting Wick to over 200 fragrant musk roses at Helmingham Hall and the geometric symmetry of designer George Carter at Silverstone Farm. There's lots to read about how the gardens evolved, plus plant and detail close-ups for those inspired to borrow ideas for their own gardens. Get children interested in gardening or plant conservation by giving them this book. Dr Chris Thorogood wants to help children see plants as exciting and individual as animals are. Catell Ronca's vivid illustrations depict plants as unusual as the Tree Shrew Toilet Pitcher, the Dead Horse Arum and the Strangler Fig. Fun, informative and with an underlying serious message about conservation.